You are currently browsing the category archive for the ‘doc updates’ category. Terse Guide to the (new) GLASS Tools post has been updated. Photo by Steve Wampler (Creative Commons). 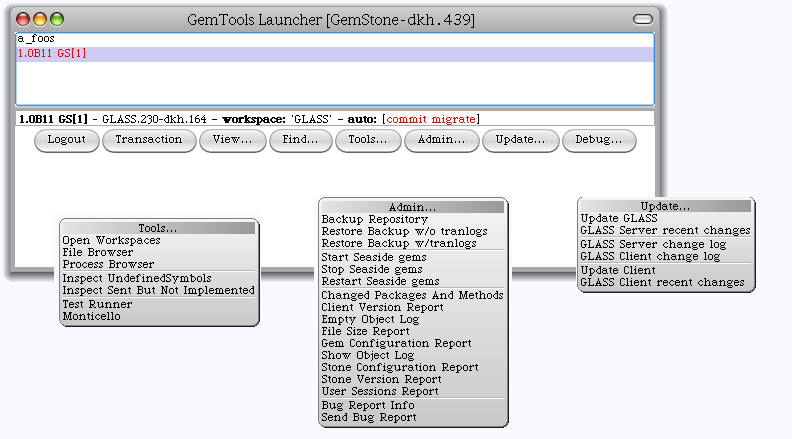 [Update 6/5/2010] For the latest GemTools 1.0-beta.6 documentation see the GemTools Guide on the glassdb wiki. This post started out as a beta update post, but as I added more and more material I realized that it deserved to be a reincarnation of the Terse Guide to the GLASS Tools. It’s been a year since I wrote the original Terse Guide and there have been significant changes to the whole GLASS tool set, so a new version has been long overdue. However, I do have an announcement post to finish (and it depends upon the information in the Terse Guide), so rather than delay the announcement of the preview release, I decided to publish the Terse Guide before it was complete. I have completed all of the sections that describe the new functionality of the GemTools Launcher, including a section on installing the GemTools Client in a fresh image. Over the next week, I plan to finish the Terse Guide. All of the screen shots in this post were taken using a Pharo image. The GemTools Client runs in both Squeak and Pharo images (see Installation and Update Steps for instructions on setting up an image). You can click on the screen shots in this post to see full size images.